The Dawn Girl’s Latin Shoe continues to be a best seller in our Children’s range here at Duo Dance London. 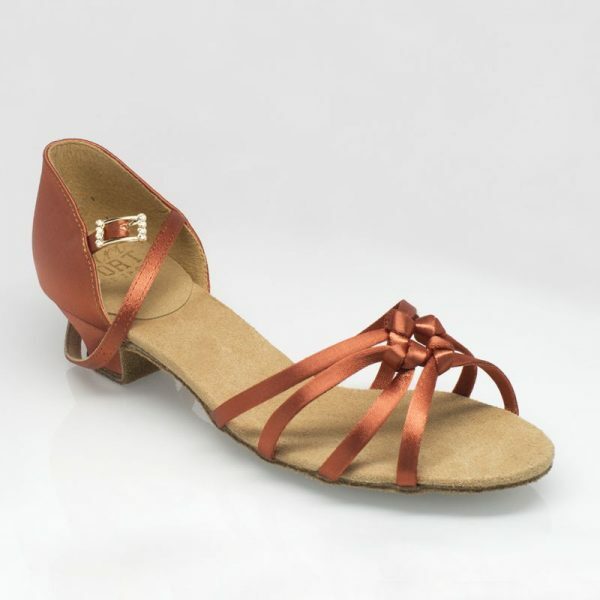 A pretty dance shoe in Dark Tan Satin with a strap design and wrap around foot strap. It is a perfect shoe for Competitions, Medal Tests and Examinations and is suitable for all styles of Latin dance. The Dawn Girl’s Latin Shoe is an open toe sandal in Dark Tan Satin. It is a 4 strap design with a knot at the vamp which adjusts and protects the foot as it is worn. This allows a good fit on most foot widths. 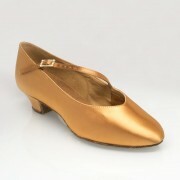 The Ray Rose Dawn comes with a 1.25″ Regulation Cuban heel suitable for both class and competitions. There is a traditional hook buckle on the ankle strap for simple and easy fastening. The Dawn is available in a regular fit and in UK Sizes C10 – 5 including half sizes. Please note that the C donates a child size, not the width of the shoe and there is no added TAX on children’s shoes and sizes. Suitable for all styles of Latin Dance. Suitable for Medal tests, examinations and competitions. Suede sole allowing the dancer to spin and glide on any dance floor. Padded insole for comfort and enhanced support. Shoe Brush with cover to keep the soles free from grime and dirt. Sturdy Shoe Bag to protect and maintain condition.